Taiko drumming team working experience for hire. Welcome to the Rhythmworks Team-Working Experience. Whether your company is expanding, changing, or in need of an energy jolt, the Rhythmworks Team-Working Experience is here to give you a huge injection of team spirit! We use the unique team ethic of Japanese Taiko drumming to bring your team together, putting in place a solid and lasting platform for teamwork to thrive. 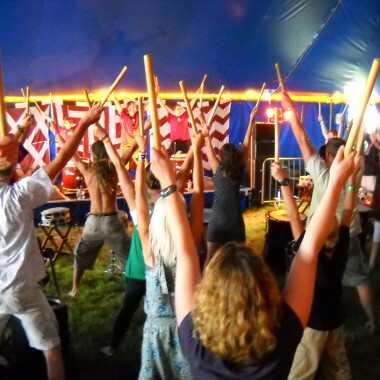 We use the team power of Japanese Taiko drumming to bring your team together and to create a lasting cohesion that they’ll take back with them to the work place. Taiko is a unique activity, which demands discipline, total commitment and focus in pursuit of a team task. In this structured and creative environment that is new to all, we enable your team to look at the foundations of effective teamwork: co-operation, mutual awareness and mutual respect in new and exciting ways. BG Group, BMC, Brathay, Claritas, London Business School, Madge.Web, Managing Development, PPP Healthcare, Scottish and Newcastle Retail, Skillvest, Yoplait Dairy Crest. Rhythmworks Course Facilitators: Rhythmworks courses are facilitated by a minimum of two experienced teachers and taiko players. Mark Alcock studied, performed and taught Taiko drumming for two years with the Tennon Daiko drummers of Wakayama prefecture in Southern Japan. 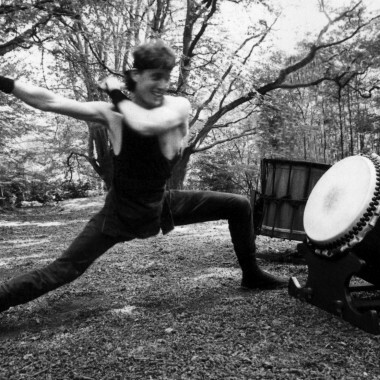 His teachers included Katsuji Kondo, former front man of the world famous Kodo drummers. On his return to England in 1994, he began playing with the Taiko master Joji Hirota, and was also one of the original members of Mugenkyo, the exciting Taiko group now based in Glasgow. He also performs with the Chinese flautist, Guo Yue and the brilliant percussionist, Peter Lockett. In these three groups, Mark has played all over the UK, in Australia, Japan, Malaysia, Italy, Austria, Luxembourg, The Canary Islands, Crete, Albania and Hungary. 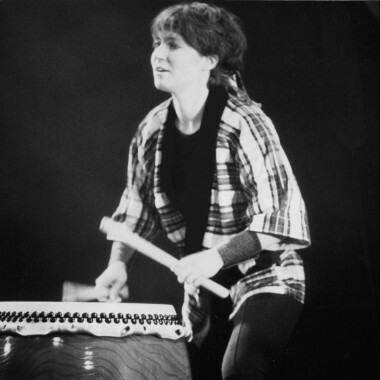 In 1996 he joined forces with James Barrow to set up the Gyosei School of Taiko, offering the first hands-on Taiko workshops in the UK to members of the public and schools. In 1999 he toured with Kagemusha Taiko’s Brother Drum project. Mark is an experienced team worker, having applied his knowledge of Taiko drumming and teamwork to the world of software engineering and to the film industry. He has worked within a software quality engineering team for Tektronix, and as an editor and post production co-ordinator on many film projects. James Barrow studied Taiko drumming and yokobue flute for 5 years with Osamu Munakata, Head of The Hiroshima Taiko Hozonkai Drum Preservation Society in Japan. During this time he became a “gashira”, leader, for part of the group’s performances, and was granted a “menkyo” licence to teach the rhythms and flute melodies of Hiroshima to others. 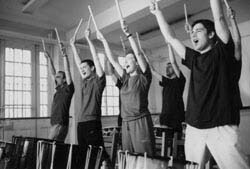 On his return to the UK in 1990 he formed Akatsuki Daiko – the first ever regularly performing taiko group in Britain. Made up of Japanese students from Gyosei International College (where James was a lecturer), the group has recently celebrated its 5th year and now has over 15 performing members. James is a qualified Music Workshop instructor having completed a course in Music Workshop Skills at Goldsmiths College, University of London. Recently he completed a tour of the UK with The Drum Orchestra, a project which brings together African Percussion, Taiko Drumming and digital percussion technology.